alaTest ha raccolto ed analizzato 100 recensioni su Babyliss 7447BU. La media della valutazione per questo prodotto è 4.4/5, confrontata con la media della valutazione di 4.3/5 per altri prodotti. Abbiamo analizzato differenti valutazioni di esperti ed utenti, età del prodotto ed altri elementi. A confronto con altri prodotti, Babyliss 7447BU ha ottenuto un alaScore™ complessivo di 89/100 = qualità Molto buono. Very happy with the service. Arrived before the due date and they are easy to use. Instructions easy to use. Great service. 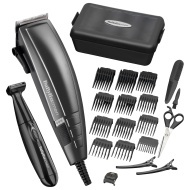 I brought this for my husband as the old one had packed in and he loves it as it comes with a beard trimmer as well as more grade options and it very tidy and neat .. I bought these hair cutters and there great. So i would recomend these. All round good product from babyliss. The battery operated trimmer for a beard not working however. Great set with everything you need and a nice box to keep them in.